Restricting CO2 emissions: New IMO plan sets global standards. On Friday, the International Maritime Organization agreed for the first time to limit greenhouse gas emissions from global shipping. The nonbinding deal marks a critical shift for the sector — which, until last week, was the only major industry without a comprehensive climate plan. From 2030, each individual vessel must reduce its emissions with 40 percent irrespective the development of world trade. The conclusions are apparent from this photo of the end document. Cargo ships are the linchpin of our modern global economy, transporting roughly 90 percent of everything we buy. They also contribute significantly to planet-warming gases in the atmosphere. If the shipping industry was a country, its total annual emissions would rank in the top 10, between those of Japan and Germany. Left unchecked, shipping-related emissions are on track to soar by as much as 250 percent by 2050 as global trade expands, the maritime body projects. Such a spike at sea would offset progress in carbon reduction made on land. The International Maritime Organization agreed to reduce emissions from global shipping by at least 50 percent from 2008 levels by 2050. The United Nations body also pledged to pursue deeper cuts to meet the Paris Agreement’s more ambitious goal of limiting global warming to 1.5 degrees Celsius, or 2.7 degrees Fahrenheit, above pre-industrial levels. The hard-won plan follows tense negotiations involving envoys from 173 countries at the organization’s headquarters on the banks of the Thames River in London. The Marshall Islands and other Pacific nations doggedly pushed the most ambitious proposal on the table: a 100-percent reduction in shipping emissions within two decades, a move that would bring the sector in line with the 1.5-degree target. The European Union also championed a plan to curb emissions by 70 to 100 percent by mid-century. Yet other powerful voices in the room, led by Japan, favored smaller emissions cuts and much longer timelines. The United States and Saudi Arabia, two oil-producing giants, objected outright to any emissions cap. Meanwhile, some shipping executives warned of rising cargo costs and threats to business if aggressive targets were put in place. “It was extremely difficult,” says Faig Abbasov, a shipping policy expert with Transport & Environment, a nonprofit advocacy group based in Brussels, Belgium. Back in 2015, The Marshall Islands was the first country to urge the International Maritime Organization to adopt a greenhouse gas strategy. It has spearheaded the charge for ambitious shipping rules ever since. 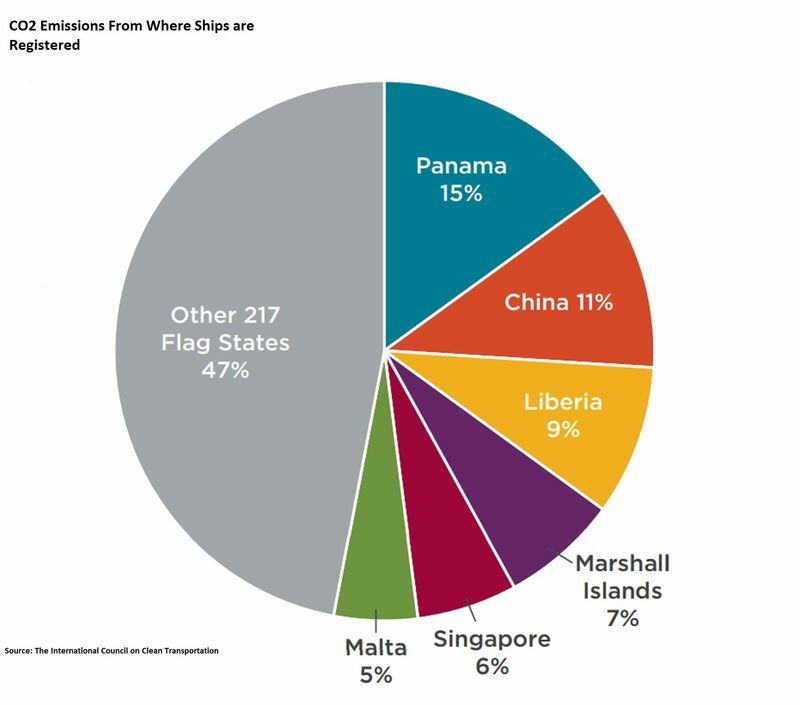 The country is home to the world’s second-largest ship registry, behind Panama, with nearly 12 percent of all cargo ships flying the Marshallese flag. And its 75,000 people depend on cargo ships to supply nearly all of their food. Yet greenhouse-gas emissions from shipping and other industries threaten the nation’s very survival, with rising sea levels, extreme storms, and severe drought pushing islanders from their homes. After the deal was struck, Paul returned to his central London hotel room overcome with relief, if not exhaustion. Still, he calls the deal the “bare minimum” of what his country could accept as climate policy. In comparing the organization’s process to a game of baseball, he says last week’s deal is just a single. Effectively, the shipping industry is only on first base enroute to full decarbonization of the sector. Last week’s agreement is an initial strategy, with a long-term plan to be adopted in 2023 — after the organization collects emissions data from cargo ships over the period between 2019 and 2021. In the meantime, regulators are expected to debate binding, enforceable steps that compel — not merely encourage — the industry to reduce its greenhouse gas emissions and a shift away from fossil fuels. No specific proposals are on the table just yet, he explains, however, short-term rules will likely target emissions from existing ship operations to keep them from rising any further. That might mean requiring crews to take steps like lowering their vessel’s operating speeds, which reduces power demand and fuel consumption — but would impact shipping time. Mid-term measures could compel shipping companies to replace carbon-intensive fuels with cleaner alternatives, including fuel cells powered by hydrogen or ammonia — or for smaller vessels, batteries that can recharge at ports. Taking these innovations mainstream, however, would likely require adopting “market-based measures,” such as a tax on carbon emissions. Dozens of small ships around the world are now running on hydrogen and electricity, and a major ferry line in Scandinavia is building two of the largest battery-powered ships to date. Energy-efficient ship designs, smarter logistics systems, and “wind-assisted” technologies, such as spinning rotor sails, are also proven ways to slash emissions. Still, many of these technologies remain prohibitively expensive for shipowners or aren’t yet available in sufficient supplies. If every cargo ship today switched to hydrogen fuel cells, for instance, most vessels wouldn’t have enough hydrogen on board to leave the port. BBC : Reality Check: Are ships more polluting than Germany? AGU : Can increasing albedo of existing ship wakes reduce climate change?